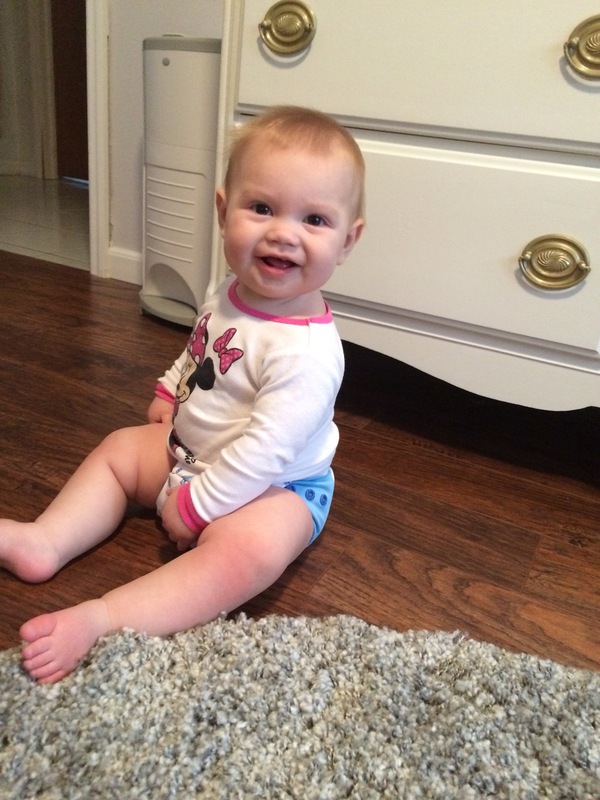 Happy 9 Months Aubrey Joy! You’re 9 months old! Sometimes I look at you and I can’t believe how big you’re getting. I swear we just brought you home from the hospital a month ago, and now you’re growing and you have this amazing little personality that makes us laugh. Today at the doctor you were 21.8 lbs (93rd percentile) and 28.25 inches (75th percentile). You’re clothes are all sorts of sizes now depending on the brand. You’ve grown out of most of your 9 month clothes. You wearing mainly 12 month clothes. Old Navy was having a baby sale (Old Navy is basically my favorite place to shop for you) so I bought you clothes in bigger sizes for you to grow into. One of those sizes being 12 – 18 months… and they already fit you. So much for growing into them! You have 6 teeth and they make you look so grown up. You officially don’t let us brush your teeth, because as soon as we try to brush them you grab the toothbrush and bite down to knaw on it… makes cleaning teeth pretty difficult. You LOVE to eat! You eat just about anything we put in front of you, but we know when you’re over it because you throw it straight on the floor. You don’t want it in front of you. You’re favorites are oranges, bananas and blueberries. I’m pretty sure you would eat an orange at every meal if we gave them to you. You’ve moved on from roasted veggies and fruits, to eating pretty much whatever we are eating (as long as it is healthy). 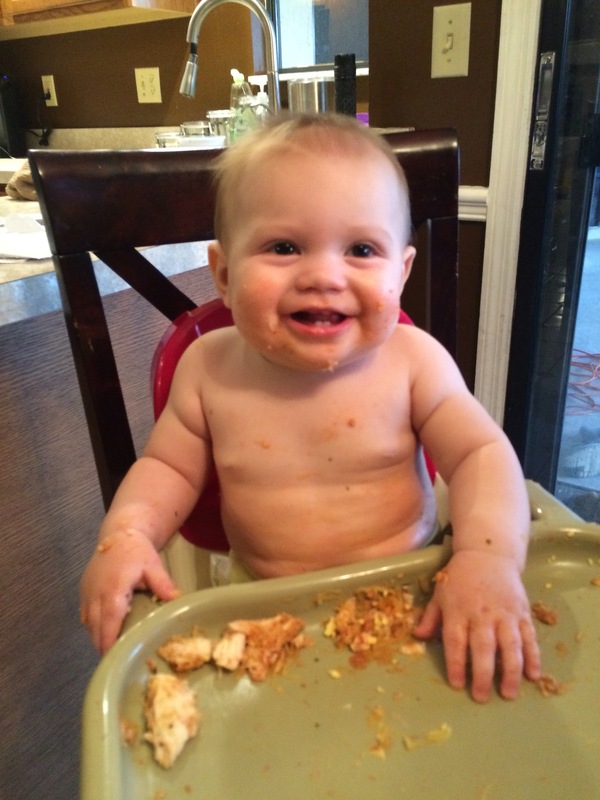 Baby Led Weaning (BLW) for the win! I did cut dairy out of your diet though to see if it helps with your eczema. It’s better, but we’re still battling it. You’re throwing us for a loop again at bedtime. This entire month has been all over the place. Some nights you go down easy as can be. 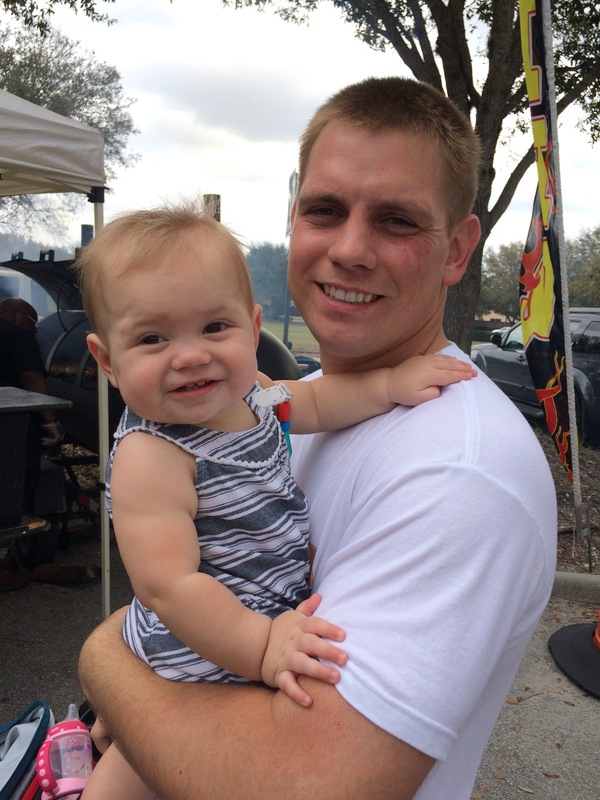 There was a two week (or longer) stretch where you would be sound asleep when I laid you down, and you would immediately wake up and cry. So then Daddy and I would take turns rubbing your back while you laid down, and you would just stare at us or your mobile or look like you were asleep. The second we took our hands off of your back you lost it. It was a REALLY long bedtime process. I think 2.5 hours was the longest… the upside to the really long bedtimes was that you slept through the night like 5 times!! WOOHOO! It’s not consistent, and you haven’t done it in a few days, but they were great when they happened. Even if they left me waking up in the middle of the night panicking. I think one night I actually asked Paul if you were alive. This week you’ve now started waking up a lot (especially in the beginning of the night) I’m going to blame it on the 8-10 month sleep regression.. but I can’t be sure. You do not stop moving. 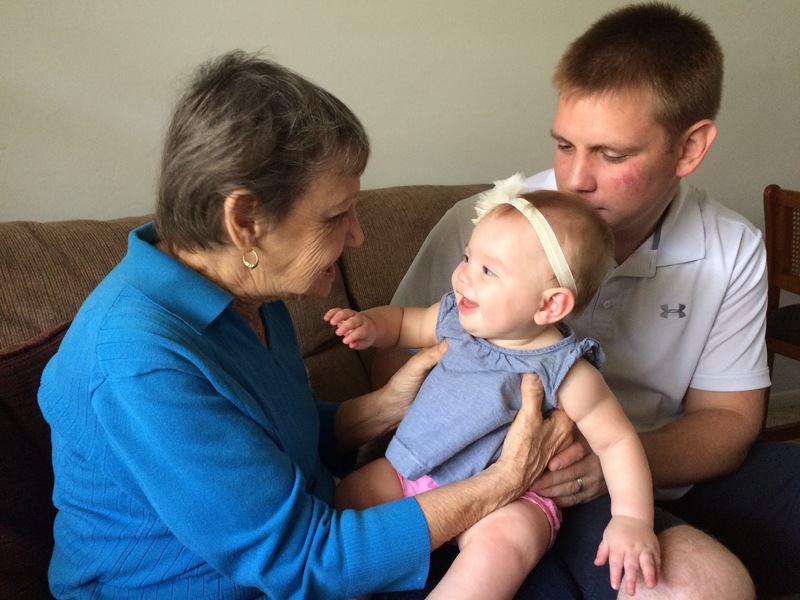 Grandma says you’re head is on a swivel, because you have to look at everything and you can’t sit still. You’re crawling everywhere, and all you want to do is stand up. I’ve barricaded you in the living room a few times this month (I was sick and Dad was out of town), and you figured out an escape each time. 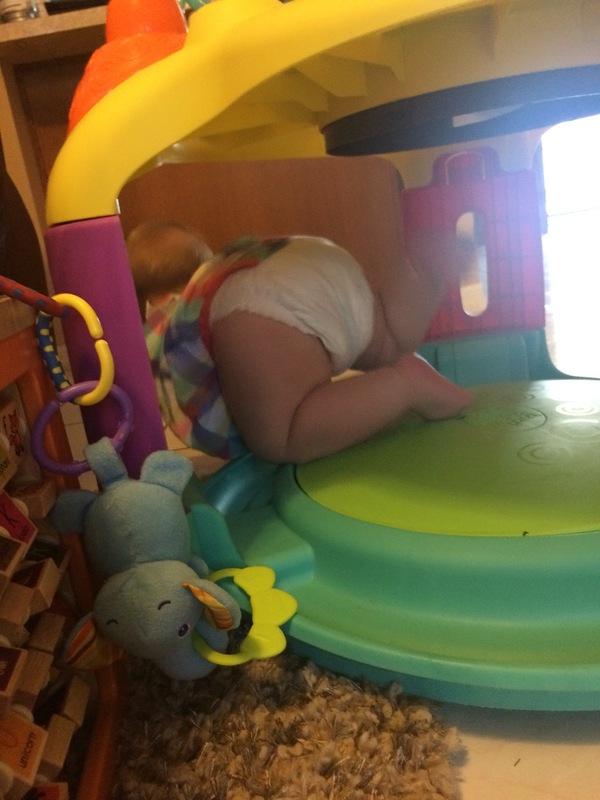 You figured out you can crawl through your exersaucer so that didn’t work. 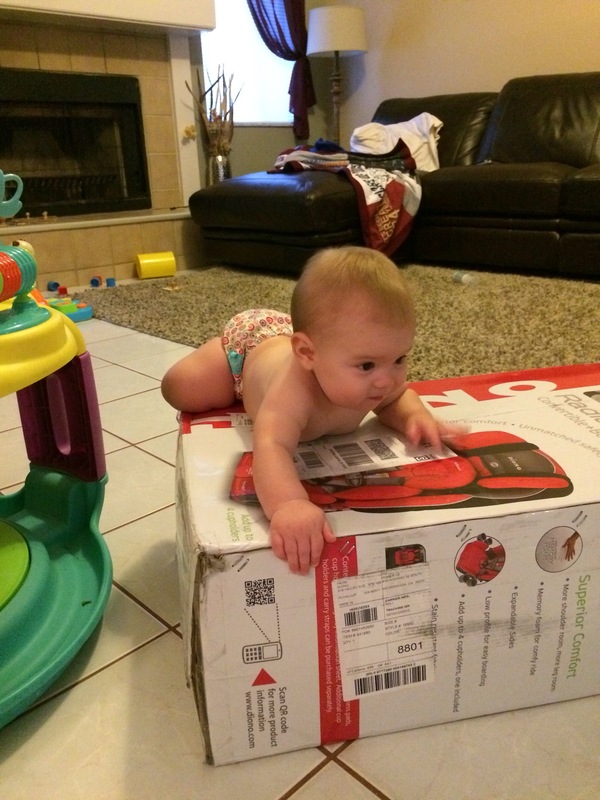 Then you figured out how to climb over the car seat box I was using to block you in. 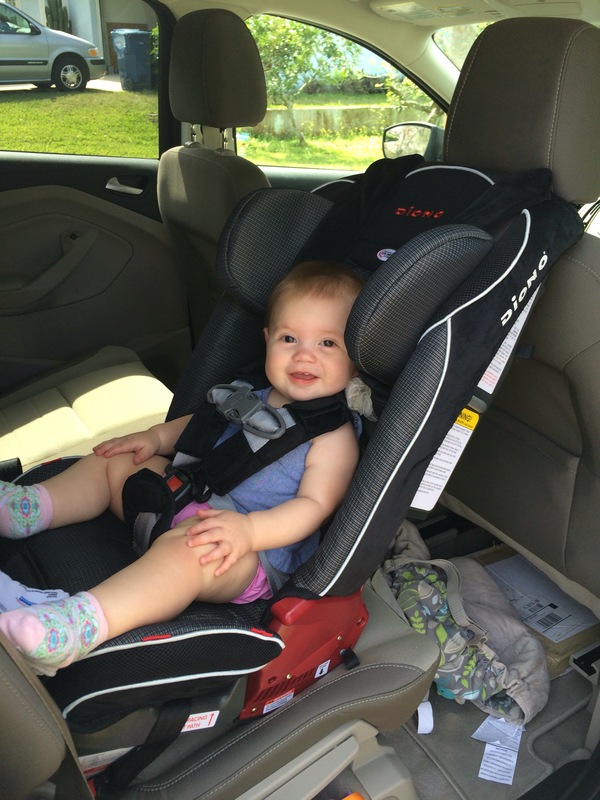 So needless to say, to keep you in one area, you go in the pack-n-play… you aren’t a fan. You started pulling yourself up and letting go to test out your balance. You actually seem pretty steady, and I honestly don’t think walking is too far off. 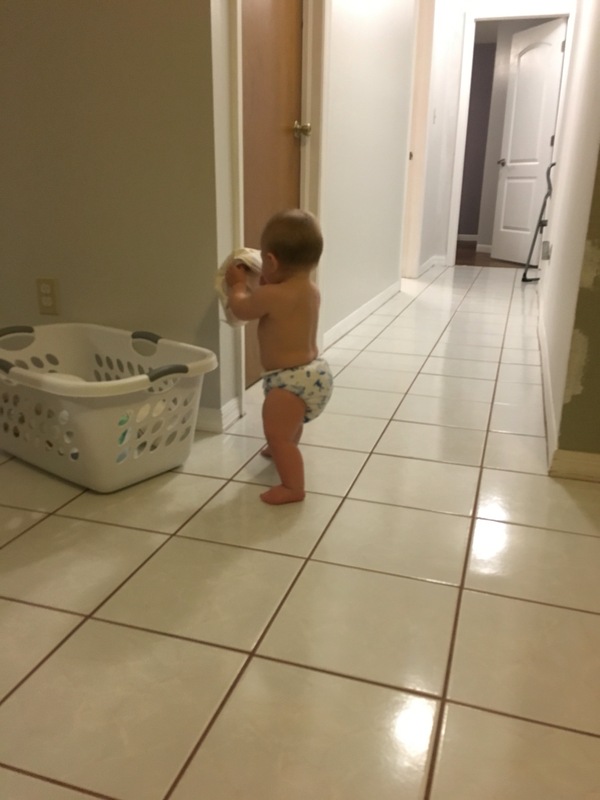 Ignore the mismatched doors and focus on the standing baby! The doors are on the to do list! 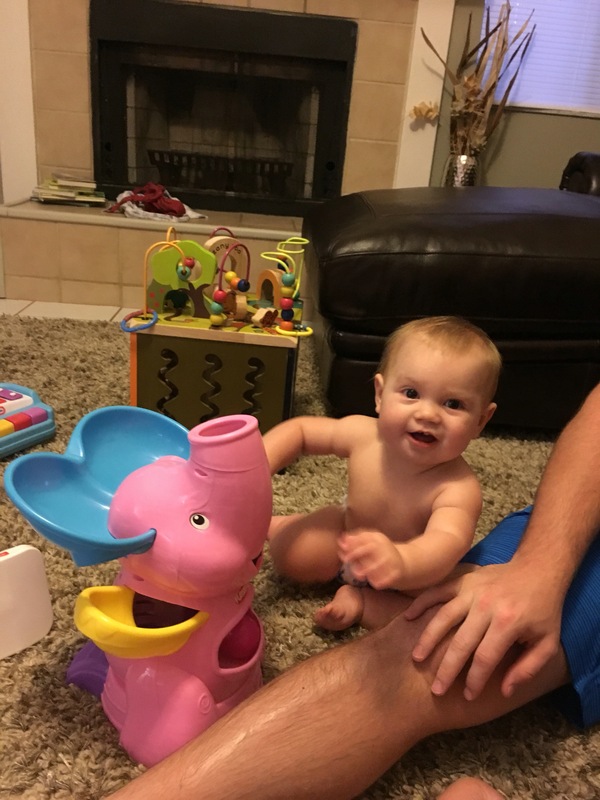 You absolutely love the toy elephant your Aunt Jen gave you for Christmas. You push the button and bounce with excitement. As soon as it ends, you press it again. 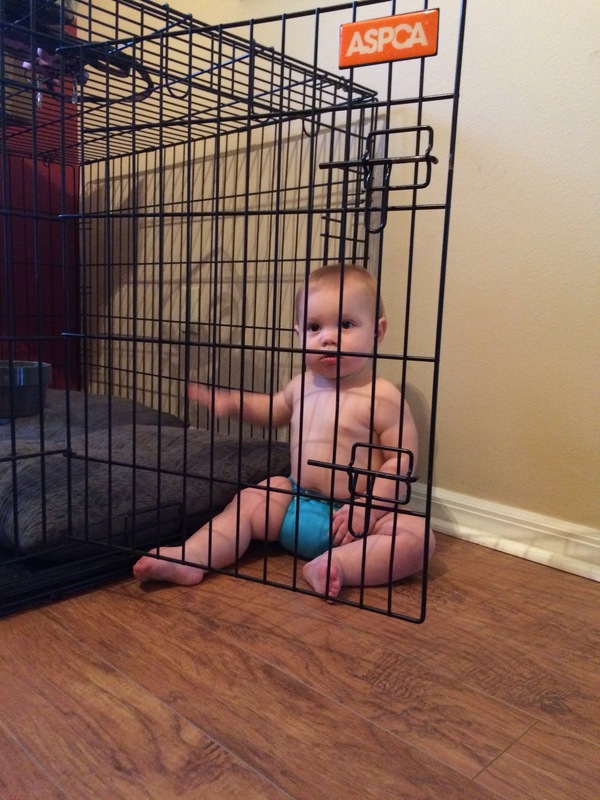 You love to play with the dog crate, much to my dismay. You’ve already figured out how to open it. I thought it was a fluke but you open it everytime I lock it. You’re laughing SO MUCH MORE! It makes me so incredibly happy! You are such a serious baby, but You give the biggest smiles. Trying to get you to laugh is so hard! Lately, you laugh so much more easily and I think there are very few things in life that will ever give me as much joy as hearing that belly laugh. You learned how to wave and give high fives this month. Sometimes it takes you a while to decide to do them, but you’ve got them figured out! 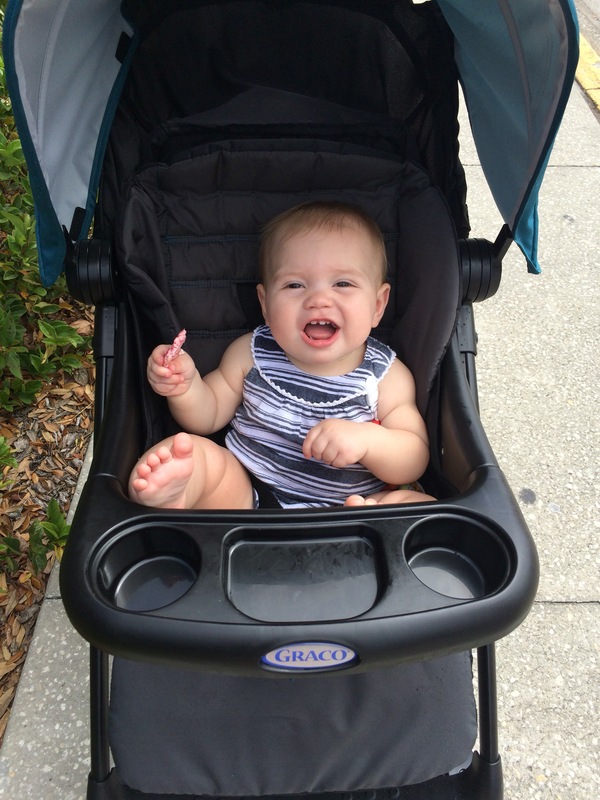 I know you’re only 9 months old today, but soon you’re going to be 1. I think about it every day, and as excited as I am to see you grow up, I wish I could figure out how to slow down time. 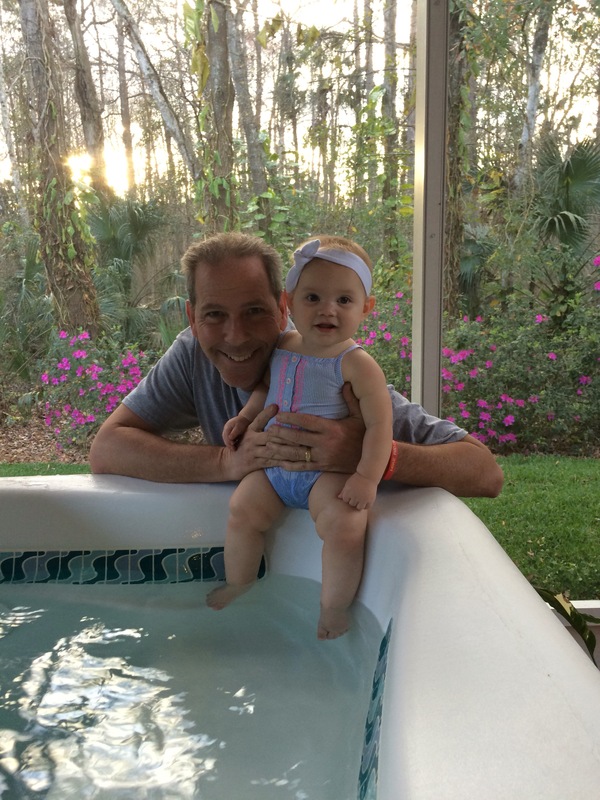 You hear it all the time while you’re pregnant and even now, “Enjoy it – they grow up quick”, but I can’t believe how incredibly true it is. 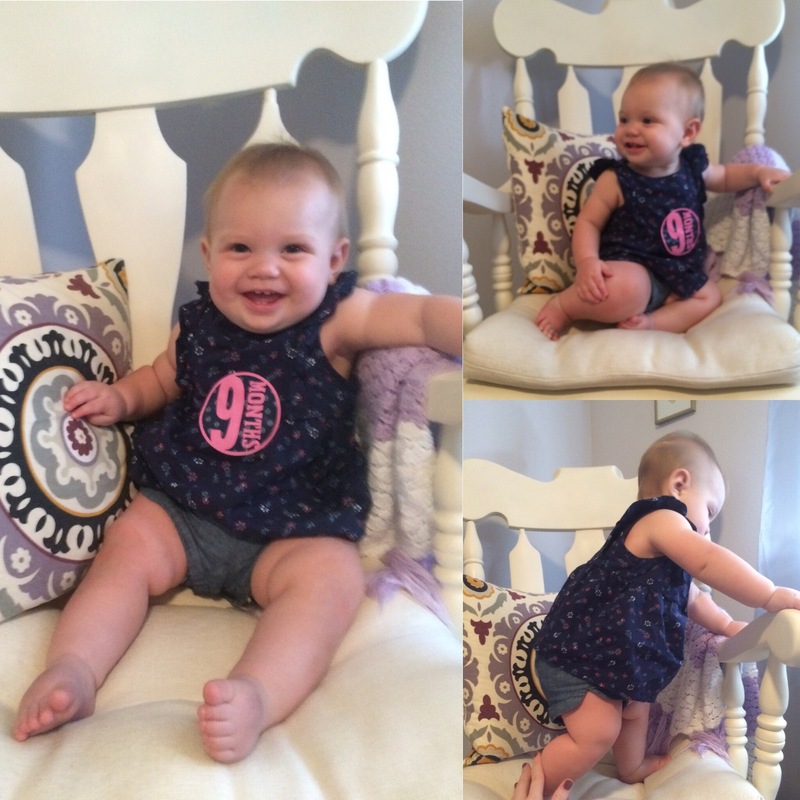 Happy 9 Months Aubrey Joy! We love you more than you know!